Around the world, we are all facing an increased attack against our freedom by the State, Capital and Religion. The State acts above all to destroy any threats to its power, which it uses to seal off borders and shut out refugees fleeing from war, misery and religious fanaticism. Which it uses to facilitate Capital's exploitation of labour and the earth, often using public funds to do so. Which is uses to protect private wealth of the elites. Which it uses to wage war. Which it uses to spy and invigilate and limit various personal freedoms. Which it uses to build up the power of the elites and usurp the rights of people to decide for themselves. The history of wars in the financial interests of elites show us how the state terrorizes populations, murdering and destroying so that a few can profit. This is the greatest form of terrorism of all. 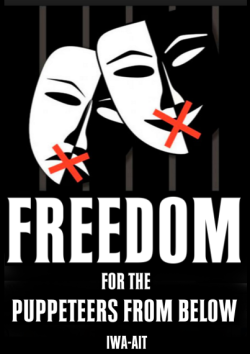 When we look at the criminalization of social movements and dissent such as what is happening today, we recognize the Spanish state as the one using actual terror – a threat of locking up people who wrote a critical theatre work. This is done in a futile attempt to strike fear into those who would be vocally critical. Futile because it is an outrage that has already been met with a large public outcry. As the attacks of the State are on the increase, we cannot retreat but must organize to resist on a global level. Freedom for the Puppeteers and Against State Terror! We have a new world in our hearts – with no room for tyranny and exploitation!